Internal view of a solar inverter. Note the many large capacitors (blue cylinders), used to store energy briefly and improve the output waveform. A solar inverter or PV inverter, is a type of electrical converter which converts the variable direct current (DC) output of a photovoltaic (PV) solar panel into a utility frequency alternating current (AC) that can be fed into a commercial electrical grid or used by a local, off-grid electrical network. It is a critical balance of system (BOS)–component in a photovoltaic system, allowing the use of ordinary AC-powered equipment. Solar power inverters have special functions adapted for use with photovoltaic arrays, including maximum power point tracking and anti-islanding protection. Stand-alone inverters, used in isolated systems where the inverter draws its DC energy from batteries charged by photovoltaic arrays. Many stand-alone inverters also incorporate integral battery chargers to replenish the battery from an AC source, when available. Normally these do not interface in any way with the utility grid, and as such, are not required to have anti-islanding protection. Grid-tie inverters, which match phase with a utility-supplied sine wave. Grid-tie inverters are designed to shut down automatically upon loss of utility supply, for safety reasons. They do not provide backup power during utility outages. Intelligent hybrid inverters, manage photovoltaic array, battery storage and utility grid, which are all coupled directly to the unit. These modern all-in-one systems are usually highly versatile and can be used for grid-tie, stand-alone or backup applications but their primary function is self-consumption with the use of storage. Solar inverters use maximum power point tracking (MPPT) to get the maximum possible power from the PV array. Solar cells have a complex relationship between solar irradiation, temperature and total resistance that produces a non-linear output efficiency known as the I-V curve. It is the purpose of the MPPT system to sample the output of the cells and determine a resistance (load) to obtain maximum power for any given environmental conditions. The fill factor, more commonly known by its abbreviation FF, is a parameter which, in conjunction with the open circuit voltage (Voc) and short circuit current (Isc) of the panel, determines the maximum power from a solar cell. Fill factor is defined as the ratio of the maximum power from the solar cell to the product of Voc and Isc. There are three main types of MPPT algorithms: perturb-and-observe, incremental conductance and constant voltage. The first two methods are often referred to as hill climbing methods; they rely on the curve of power plotted against voltage rising to the left of the maximum power point, and falling on the right. A solar micro-inverter in the process of being installed. The ground wire is attached to the lug and the panel's DC connections are attached to the cables on the lower right. The AC parallel trunk cable runs at the top (just visible). Solar micro-inverter is an inverter designed to operate with a single PV module. The micro-inverter converts the direct current output from each panel into alternating current. Its design allows parallel connection of multiple, independent units in a modular way. Micro-inverter advantages include single panel power optimization, independent operation of each panel, plug-and play installation, improved installation and fire safety, minimized costs with system design and stock minimization. A 2011 study at Appalachian State University reports that individual integrated inverter setup yielded about 20% more power in unshaded conditions and 27% more power in shaded conditions compared to string connected setup using one inverter. Both setups used identical solar panels. Solar grid-tie inverters are designed to quickly disconnect from the grid if the utility grid goes down. This is an NEC requirement that ensures that in the event of a blackout, the grid tie inverter will shut down to prevent the energy it produces from harming any line workers who are sent to fix the power grid. Grid-tie inverters that are available on the market today use a number of different technologies. The inverters may use the newer high-frequency transformers, conventional low-frequency transformers, or no transformer. Instead of converting direct current directly to 120 or 240 volts AC, high-frequency transformers employ a computerized multi-step process that involves converting the power to high-frequency AC and then back to DC and then to the final AC output voltage. Historically, there have been concerns about having transformerless electrical systems feed into the public utility grid. The concerns stem from the fact that there is a lack of galvanic isolation between the DC and AC circuits, which could allow the passage of dangerous DC faults to the AC side. Since 2005, the NFPA's NEC allows transformer-less (or non-galvanically) inverters. The VDE 0126-1-1 and IEC 6210 also have been amended to allow and define the safety mechanisms needed for such systems. Primarily, residual or ground current detection is used to detect possible fault conditions. Also isolation tests are performed to ensure DC to AC separation. 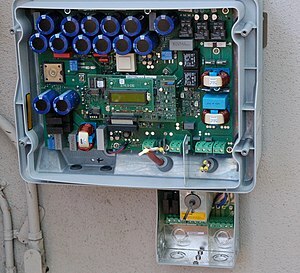 Many solar inverters are designed to be connected to a utility grid, and will not operate when they do not detect the presence of the grid. They contain special circuitry to precisely match the voltage, frequency and phase of the grid. Advanced solar pumping inverters convert DC voltage from the solar array into AC voltage to drive submersible pumps directly without the need for batteries or other energy storage devices. By utilizing MPPT (maximum power point tracking), solar pumping inverters regulate output frequency to control the speed of the pumps in order to save the pump motor from damage. Solar pumping inverters usually have multiple ports to allow the input of DC current generated by PV arrays, one port to allow the output of AC voltage, and a further port for input from a water-level sensor. As of 2014, conversion efficiency for state-of-the-art solar converters reached more than 98 percent. While string inverters are used in residential to medium-sized commercial PV systems, central inverters cover the large commercial and utility-scale market. Market-share for central and string inverters are about 50 percent and 48 percent, respectively, leaving less than 2 percent to micro-inverters. String inverter up to 100 kWp(c) 98% 50% Cost(b) €0.15 per watt-peak. Easy to replace. Central inverter above 100 kWp 98.5% 48% €0.10 per watt-peak. High reliability. Often sold along with a service contract. Micro-inverter module power range 90%–95% 1.5% €0.40 per watt-peak. Ease of replacement concerns. Power optimizer module power range 98.8% N/A €0.40 per watt-peak. Ease of replacement concerns. Inverter is still needed. About 0.75 GWP installed in 2013. ^ Solar Cells and their Applications Second Edition, Lewis Fraas, Larry Partain, Wiley, 2010, ISBN 978-0-470-44633-1 , Section10.2. ^ "3 Types of Solar Inverters Explained". do it yourself. Retrieved 15 February 2017. ^ "Invert your thinking: Squeezing more power out of your solar panels". scientificamerican.com. Retrieved 2011-06-09. ^ Benanti, Travis L.; Venkataraman, D. (25 April 2005). "Organic Solar Cells: An Overview Focusing on Active Layer Morphology" (PDF). Photosynthesis Research. 87 (1): 73–81. doi:10.1007/s11120-005-6397-9. PMID 16408145. Retrieved 27 August 2013. ^ "Evaluation of Micro Controller Based Maximum Power Point Tracking Methods Using dSPACE Platform" (PDF). itee.uq.edu.au. Archived from the original (PDF) on 2011-07-26. Retrieved 2011-06-14. ^ Hohm, D. P.; Ropp, M. E. (2003). "Comparative Study of Maximum Power Point Tracking Algorithms". Progress in Photovoltaics: Research and Applications. 11: 47–62. doi:10.1002/pip.459. ^ "A SIDE-BY-SIDE COMPARISON OF MICRO AND CENTRAL INVERTERS IN SHADED AND UNSHADED CONDITIONS" (PDF). Archived from the original (PDF) on 14 July 2014. Retrieved 27 August 2013. ^ Photovoltaics: Design and Installation Manual. Newsociety Publishers. 2004. p. 80. ^ "Summary Report on the DOE High-tech Inverter Workshop" (PDF). Sponsored by the US Department of Energy, prepared by McNeil Technologies. eere.energy.gov. Archived from the original (PDF) on 2012-02-27. Retrieved 2011-06-10. This page was last edited on 18 February 2019, at 05:39 (UTC).